These vehicles were ordered by Northern General and diverted to PMT. The destination blind boxes were quickly converted to PMT spec. A very poor bus in performance and ride quality having a Gardener 5cyl engine. Best part about them was light steering and in the summer you could drive with the cab door open. Although reliable they never strayed far from the depot. I managed to do 42 mph once in one. These had all gone by the time I was at PMT. Being highbridge I would imagine they were allocated to Newcastle Depot. 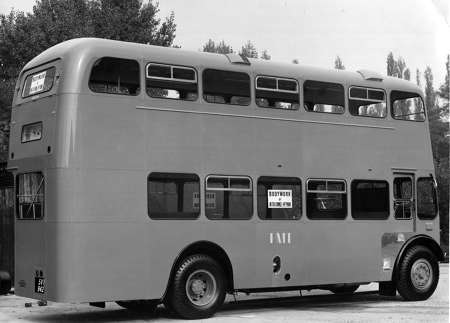 I well remember the poor performance of the 1956 Daimler CVG5s but those later fitted with a 6LW were a much better bus. I think the Orion looks better on a traditional-radiator Guy Arab IV than on any other chassis. Michael: when you spoke of poor ride quality, was that just the vibration from the 5LW, or did they give a choppy ride as well? I’m curious because Aldershot & District had Orion bodies on one batch of their Dennis K4s and found that the spring settings that suited the heavier East Lancs batch very well had to be modified for the Orions. Good to know that you found the steering light. I’ve read elsewhere that some drivers found Arab IV steering heavy, which in view of the excellence of Guy design at that time surprised me. A maintenance issue? Or was the light steering of this Potteries batch attributable to the lightness of the 5LW+Orion combination? 42 mph sounds pretty spectacular, by the way. I wonder whether these machines had a high final-drive ratio, which would yield wonderful fuel consumption on long, flat runs, but would certainly contribute to the impression of sluggishness on start-stop work. Ian, I’ve just seen the photo and your comment about how the Orion looks and couldn’t agree more. 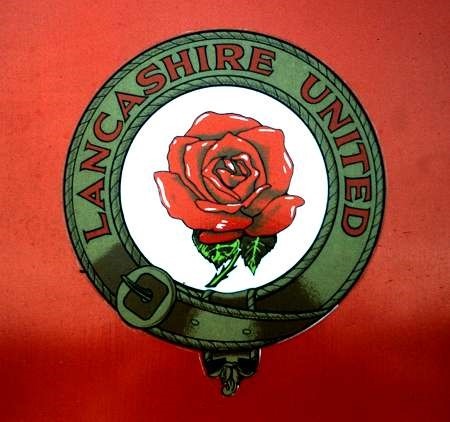 I remember seeing these in the Newcastle areas (both Tyneside and the Potteries) as a boy and they always looked impressive. Somehow the solid colour scheme helps. 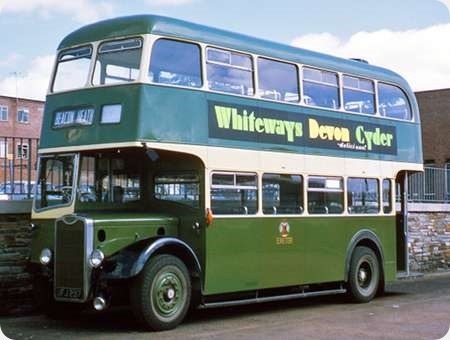 Just a thought: I have read elsewhere that differences in steering characteristics between buses of the same type with different operators were sometimes caused by the fitting of different tyres. Peter, different tyres certainly would make some difference. At PMT a white steering wheel denoted a highbridge bus. Did the NGT buses of this type have normal black steering wheels? The harsh ride was down to the suspension. At the time I think we were running on Firestone tyres at Newcastle Depot. Does anyone know the location in this picture? I think the destination blind reads Newcastle via Garner Street. The means of indicating height or width to drivers (and bus wash operators) is a subject in itself. 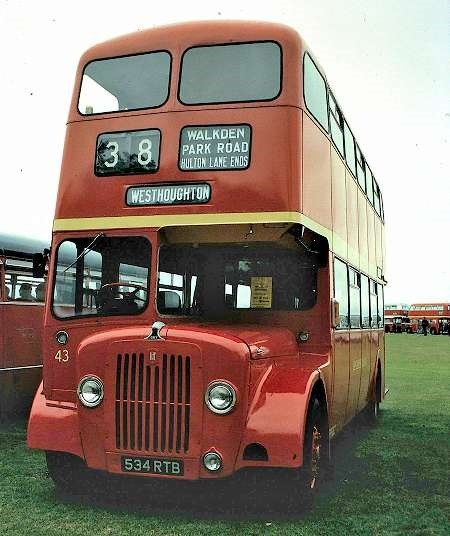 Sheffield and Chesterfield buses carried a letter W on the dash to indicate 8 feet width, but for whose benefit? Preserved Chesterfield 225 has a yellow steering wheel, which I was told indicated highbridge. Some Southend vehicles carried a red one – was this to indicate height or width? 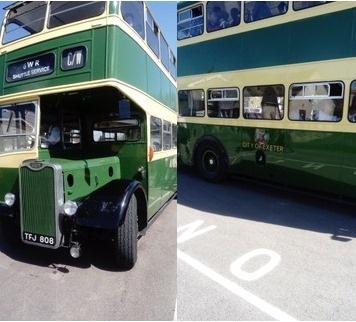 Bristol Tramways/Omnibus fitted white steering wheels to their 8-foot wide buses to warn drivers not to take one over a narrow bridge across the harbour. ECOC and several other Tilling Group companies did the same but it cannot have been general Group policy as Thames Valley KSWs had a black one. I disagree, Michael, in my opinion the harsh ride was due to the poor construction and extreme lightness of the early Orion bodies. The second batch we had a Percy Main, FT 9003/7 were an improvement on the first ones, FT 7893/6, however, the 1956 Park Royal bodied Arab IV was a superb vehicle in every sense bar one, NGT still specified the 5LW rather than opting for the 6LW. Having said that, they could scale the North face of the Eiger if asked to do so. As for speed, I think they must have had a high ratio diff, as they could get up to around the fifty mark. White steering wheels? The only ones I can remember at Percy Main were on the Daimler Fleetlines. and also a picture of same having had a bit of a hard life. Michael’s second photo reminds me that PMT’s vehicles in the mid to late 1960s often had a care worn, shabby look. 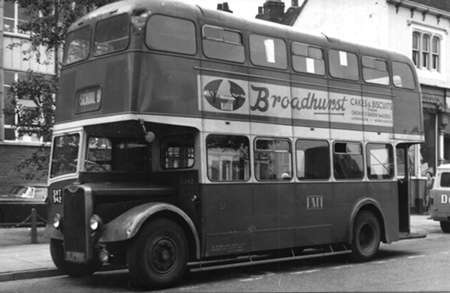 The red Steering Wheels at Southend was to warn that the bus was a highbridge and therefore banned from services 7/8 which had very low railway bridges. Chris Barker asked about location. 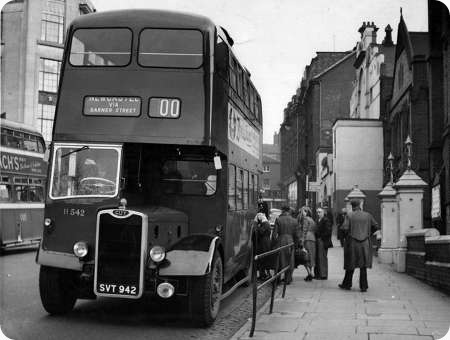 This image is Trinity St in Hanley, opposite the then Odean Cinema. I regularly travelled this route in late 50s/ early 60s. Little did I know that a decade later I’d be driving for PMT, though from Stoke Depot.